When printing a document, you often need to adjust how your work fits on the page. Use the Page Setup dialog box to adjust how your work fits on a page. View the Page Setup dialog box. Size: Lets your program know what size of paper you’re currently using. Leave this option set to Letter to print on standard, 8.5-x-11-inch sheets of paper. Change this setting if you’re using legal-size paper (8.5 x 14), envelopes, or other paper sizes. Source: Choose Automatically Select or Sheet Feeder unless you’re using a fancy printer that accepts paper from more than one printer tray. People with two or more printer trays can select the tray containing the correct paper size. 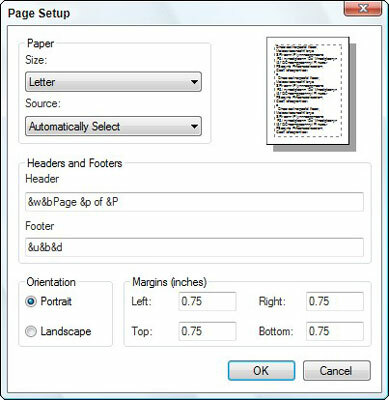 Header/Footer: Type secret codes in these boxes to customize what the printer places along the top and bottom of your pages: page numbers, titles, and dates, for example, as well as their spacing. Orientation: Leave this option set to Portrait to print normal pages that read vertically like a letter. Choose Landscape only when you want to print sideways, a great way to print wide spreadsheets. Margins: Feel free to reduce the margins to fit everything on a single sheet of paper. You may need to change them for homework requirements, as well. Printer: If you have more than one printer installed on your computer or network, click this button to choose which one to print your work. Click here to change that printer’s settings as well.